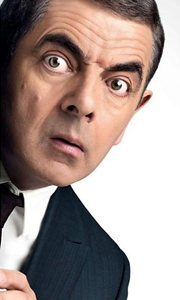 Rowan Atkinson plays Johnny English, the last remaining British spy, and Britain's last hope! With the assistance of his sidekick Bough (Ben Miller, The Parole Officer), he must investigate the mysterious theft of the British Crown Jewels. The prime suspects are Pascal Sauvage (John Malkovich), a mysterious French entrepreneur, and the enticing Lorna Campbell (Natalie Imbruglia). Johnny must get to the truth without denting the nation's..
Rowan Atkinson (Mr Bean) returns to the role of the accidental secret agent who doesn’t know fear or danger in the hugely entertaining action-packed comedy Johnny English Reborn. Fighting double agents and a killer cleaner in his disastrous style, Johnny English tries to uncover a plot against the Chinese Prime Minister with hilarious consequences. Special Features 45 Minutes Of Deleted/Extended Scenes, Gag Reel, The Wheel Chair Chase,..
Rowan Atkinson (Mr Bean) returns to the role of the accidental secret agent who doesn’t know fear or danger in the hugely entertaining action-packed comedy Johnny English Reborn. Fighting double agents and a killer cleaner in his disastrous style, Johnny English tries to uncover a plot against the Chinese Prime Minister with hilarious consequences. Special Features Disc 1 - Blu-Ray: Feature Film In High Definition, 45 Minutes Of Delete..
Rowan Atkinson returns to the role of the accidental secret agent who doesn’t know fear or danger in the hugely entertaining action-packed comedy Johnny English Reborn, also starring Gillian Anderson, Rosamund Pike, Dominic West and Daniel Kaluuya. Fighting double agents and a killer cleaner in his disastrous style, Johnny English tries to uncover a plot against the Chinese Prime Minister with hilarious consequences.... Special Feature..
Johnny English: Rowan Atkinson plays Johnny English, the last remaining British spy, and Britain's last hope! With the assistance of his sidekick Bough (Ben Miller), he must investigate the mysterious theft of the British Crown Jewels. The prime suspects are Pascal Sauvage (John Malkovich), a mysterious French entrepreneur, and the enticing Lorna Campbell (Natalie Imbruglia). Johnny must get to the truth without denting the nations prid..
Johnny English: Rowan Atkinson plays Johnny English, the last remaining British spy, and Britain's last hope! With the assistance of his sidekick Bough (Ben Miller), he must investigate the mysterious theft of the British Crown Jewels. The prime suspects are Pascal Sauvage (John Malkovich), a mysterious French entrepreneur, and the enticing Lorna Campbell (Natalie Imbruglia). Johnny must get to the truth without denting the nation's pri..
Johnny English Rowan Atkinson stars as the title character in Johnny English, an office-bound junior intelligence worker suddenly thrust into the spotlight when the Crown Jewels are stolen from the Tower of London and a plot is uncovered that threatens world security. A bit unseasoned but extremely enthusiastic, English is quickly outfitted with a highly-specialized automobile, armed with the ultimate in intelligence gadgetry and allow..